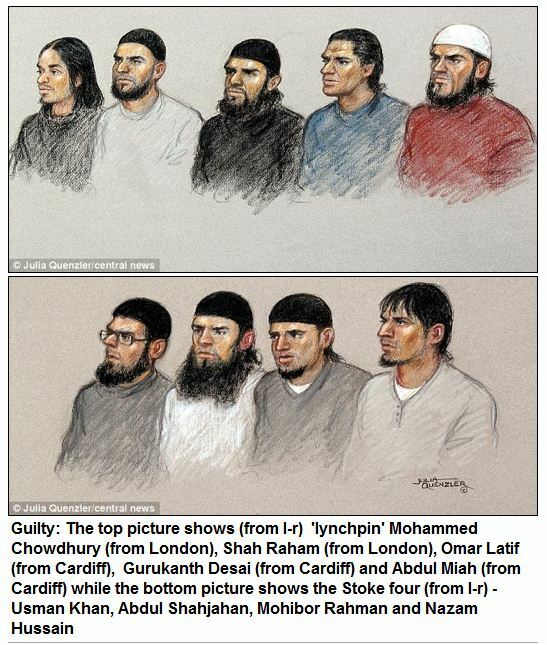 MUMBAI-STYLE ATTACK ON LONDON PLANNED BY FOUR MUSTARDS…….. – The Tundra Tabloids……. MUMBAI-STYLE ATTACK ON LONDON PLANNED BY FOUR MUSTARDS……..
Four radical Islamists have admitted an al Qaeda-inspired plot to detonate a bomb at the London Stock Exchange. The Muslim fundamentalists’ group wanted to send five mail bombs to various targets during the run up to Christmas 2010 and discussed launching a ‘Mumbai-style’ atrocity. A hand-written target list found at one of the defendant’s homes listed the names and addresses of London Mayor Boris Johnson, two rabbis, the American Embassy and the Stock Exchange. Previous Post Previous Post MUSLIM GETS BEATEN TO A PULP BY SIBLINGS FOR SMOOCH WITH ‘WHITEY’……. Don’t care if they’re British. Stick them on a plane and send them to the Middle East destination of their choice (not Israel). …that will not stop them from continuing to plot against UK.